Is your NES giving you problems? Do your games seem to be not working the way they used to? Or maybe your screen just flashes yellow and gray? It could be that your old 72pin connector is broken! The original connectors had a design flaw, and were made of cheap metal that corrodes after time. This connector is made of a much stronger metal than the original. It is the strongest one you can find and it will not corrode over time. It works with the original 8-bit Nintendo system, and is simple to replace, only a Phillips head screwdriver is needed to complete installation in minutes. Does your screen flash? Or maybe it flashes yellow or gray, or your games hang up right in the middle of playing? If so, then a new connector will solve your problem! The original connectors had a design flaw, and were made of cheap metal that corrodes after time. Well, this 72 pin is the ANSWER!! Your Nintendo system could be running again in just a few days! You are BUYING a BRAND NEW! 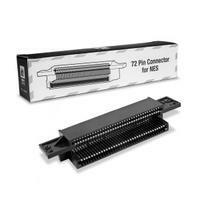 FACTORY SEALED "72 Pin" Connector for the Nintendo NES System. The best pins you can buy! I bought two of these 72 pin Nintendo connectors; these are the best connectors you can get. I purchased a connector from someone on eBay a week ago thinking I’d save a little money because it was $3 dollars less biggest waste of money pins were bent and one broke on me. After installing these connectors the two Nintendo’s I’m fixing worked like new.